Tossing this out in case you're looking for a flick or two to entertain you tonight. There are plenty of treats to pick through here, as well as a couple of tricks. If you have Prime, I also recommend the series Lore which covers the real life strange and weird from history. It's very appropriate for Halloween viewing. Saw this last night at Symphony Hall with the Boston Pops playing the soundtrack live. Simply incredible! Boys and girls of every age came dressed in costume and there was trick or treating throughout the building. First off, if you plan on watching this one, skip the trailer. It pretty much gives all the good parts away. It's kind of a fun flick because the killers are three 10 year olds, all born on the same day during an eclipse, suddenly becoming homicidal. I don't know if it's better or worse that the kids aren't even creepy looking. On the other hand, nearly everything about the movie is...not great. Lame: Some of the most awkward looking teen make out scenes ever. There is in fact, no blood, on the birthday...what the heck? It took my eyes awhile to adjust to the 3rd gen VHS look of this. I totally get what they were going for and I love them for it but it's just a bit too long. 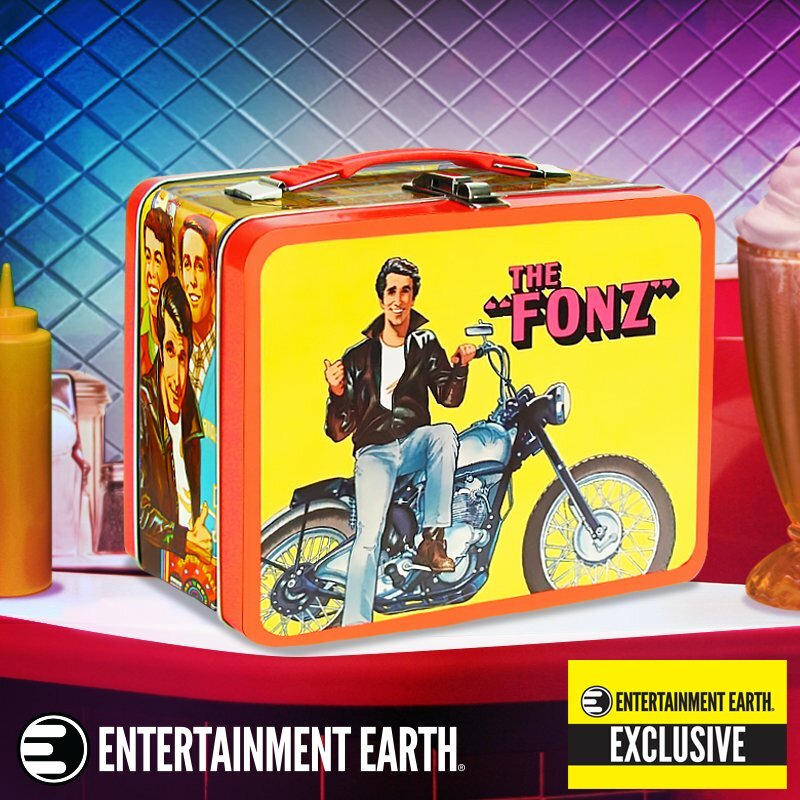 Anyone that grew up in the 80s should see this at least once. Pretty much a snooze fest for the first hour. It's about 66% teen drama, 33% slasher, and 1% Saturday Night Fever. If you could cut about half the movie out that's after the first 10 minutes and when the killer shows up, it would be better. Lame: I must not have been paying close enough attention because I wasn't sure exactly who the killer was when they were unmasked. Awkward. I had the joy of seeing this at the New England premiere as part of SalemHorror's programming. This is a wickedly fun time! It's a little like Mean Girls/Heathers mixed with social media plus a swirl of Scream. It managed to keep me guessing how things would play out. Lame: My biggest problem: Jack Quaid (the main dude) can't pull off high schooler. Rating: 8/10, find screenings on the film's website and go see it! The trailer makes this look like a very different film than it actually is. While that was disappointing in one way, it was a nice surprise as I discovered what the story would be. Can't really talk about it too much without giving away the good stuff. Of everything that you might watch from this list tonight, this is my Numero Uno pick. Once it gets rolling, it doesn't take it long to go over the top. The main characters are a treat to watch and are great together. Rating: 8/10, definitely a good time! No horror franchise should still be this entertaining by its seventh go round. Not only is it a solid slasher but it's damn gorgeous to look at. This movie is like a band you thought was cool in the 80s that's looking to make a quick buck by pumping out the hits with minimum effort. Maybe it's because it's been awhile since I watched nay of these but I was hoping for it to go out with a bigger bang. Cool/Lame: The "real world" stuff is more interesting than the fantastical horror stuff. I picked up this Something Weird Video DVD years ago and finally remembered to watch it this year. I knew it wasn't going to be great but wow, this is a new level of terrible. 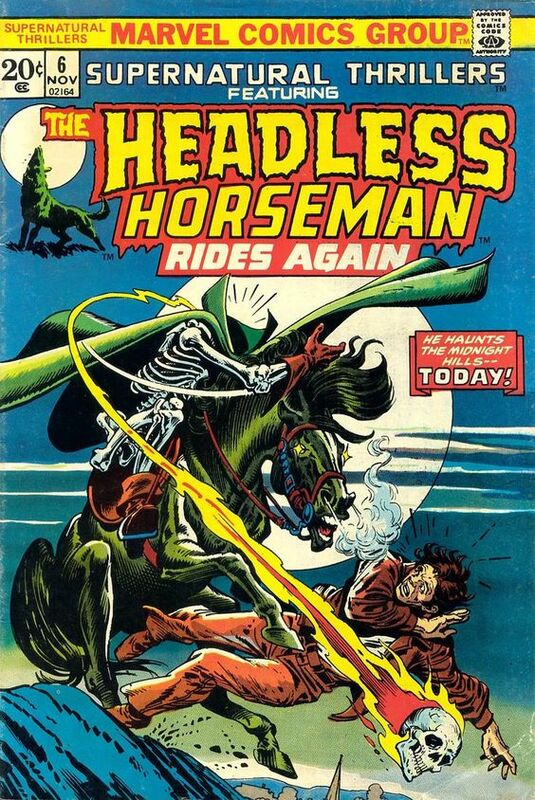 Who sets a story about the Headless Horseman at an Old West tourist trap? Didn't see the first two? That's okay, they don't exist but they'll catch you up anyway! I think most people will either find this ridiculously stupid or entertaining, and a few people will go with both. It's a send up of 80s slashers with gallons of blood. Cool: Creative kills with plenty of gore. I actually like the killer's backstory, it's fun. Lame: Drags a little in places because the jokes aren't enough to keep it interesting. 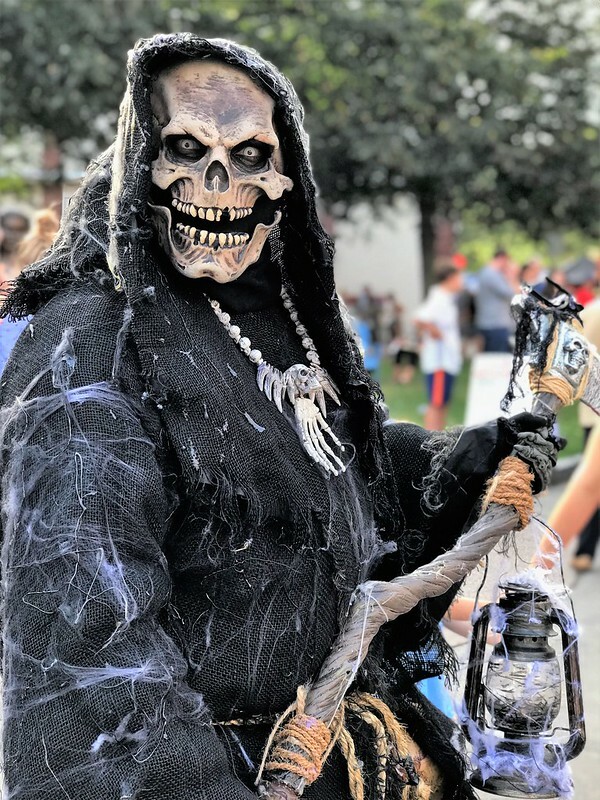 Salem's tourist season starts ramping up in September and then goes all out starting with the annual Haunted Happenings parade. 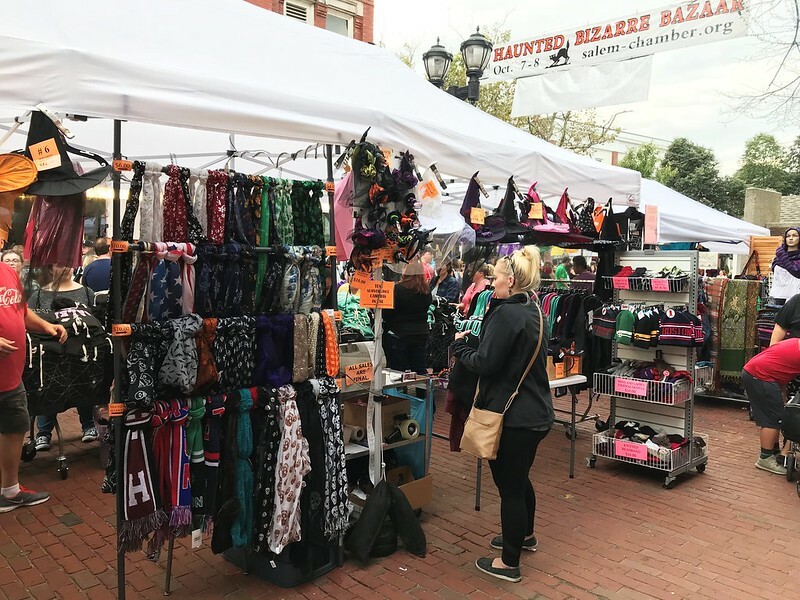 Every weekend in October, there is the Haunted Bizarre Bazaar which is a fantastic street fair with all sorts of vendors. 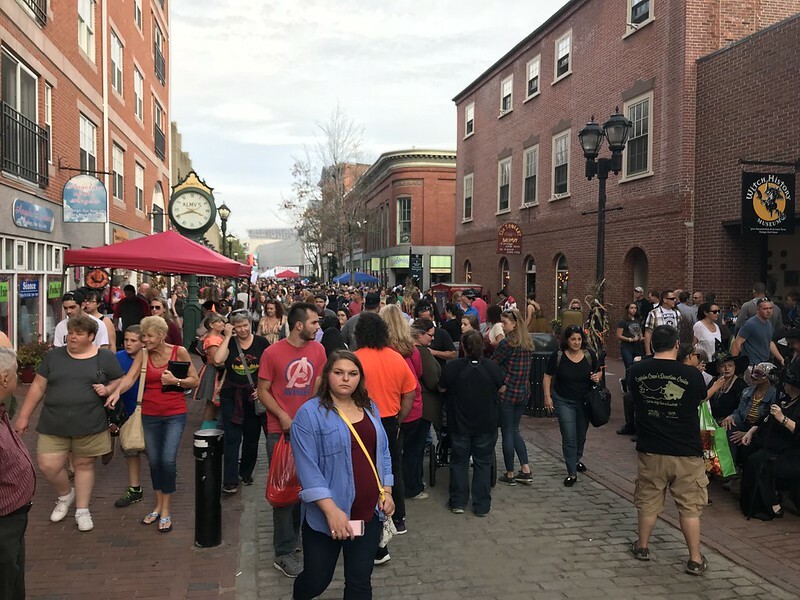 The fair is held in the Essex Pedestrian Mall downtown. My usual tradition is to visit on the first Saturday of October, which is when most of these were taken. 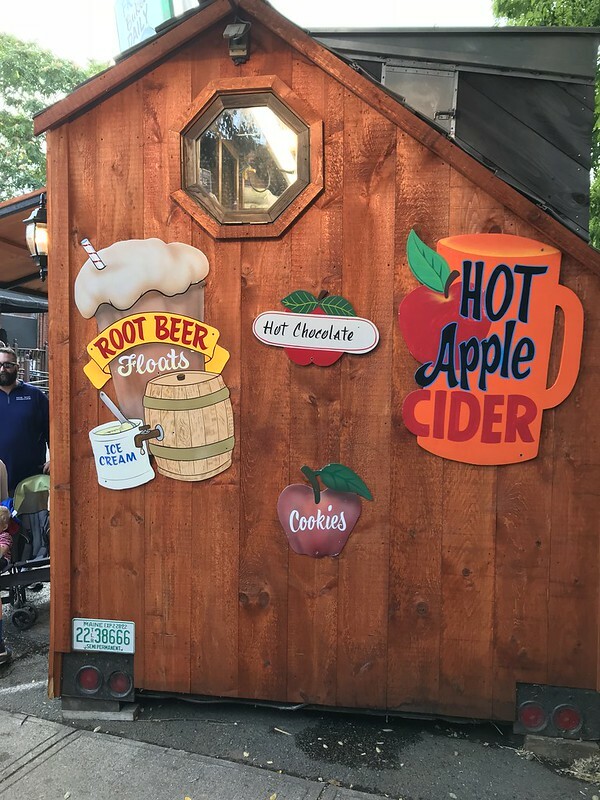 I also generally get some hot cider but since temps were close to 70 this year, I skipped on that. Being such unusually warm weather, there were a lot of people out. There are all sorts of vendors set up along the Mall. 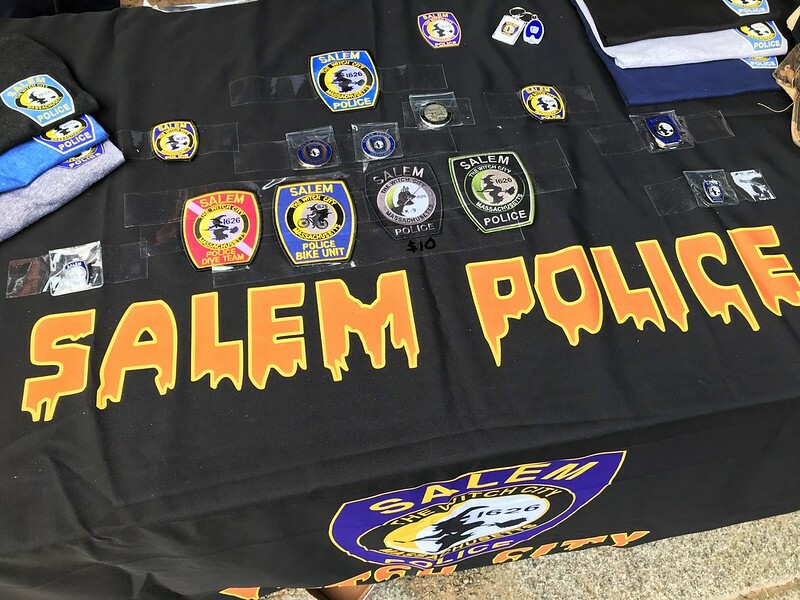 Even the Salem PD have a booth selling shirts and patches to raise money. and some sell things you might find in a witch's cupboard. 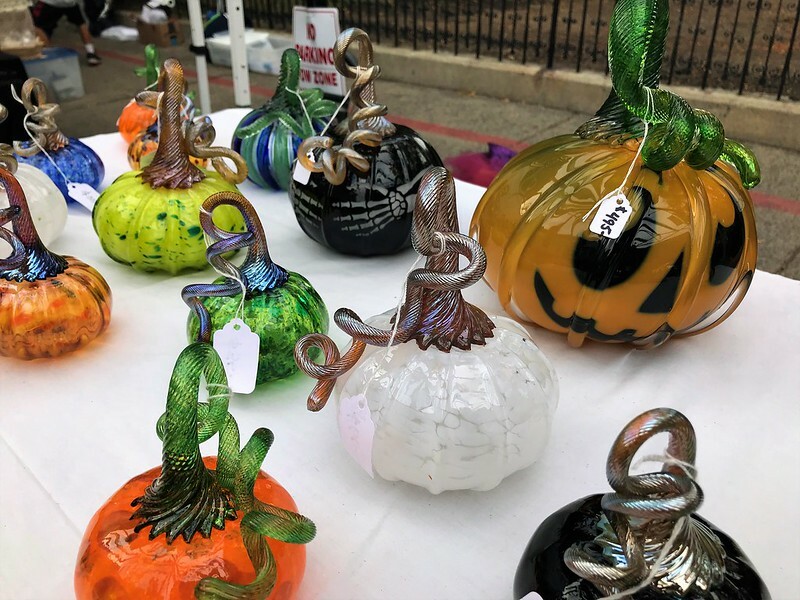 As you might expect, there's no shortage of regular shops in downtown Salem that sell jewelry, stones, charms, and other magical things. One of the booths that really caught my eye had glass gourds. I talked to the woman running the stand while I was taking photos. She told me all about the young guy, who is an MIT student, and the process of creating these works of art. I sort of wish I'd recorded everything she told me because it would be a fascinating post all on its own. The graphic ones, like the pumpkin and skeleton hands next to it, require a crazy amount of work which is why they are priced around $500! There are also a lot of art vendors. When I went back last weekend, I got to meet/chat with Jeff Stones, author/artist behind 99 Stormtroopers Join the Empire. It's a really fun book, and it was great to talk Star Wars with him. 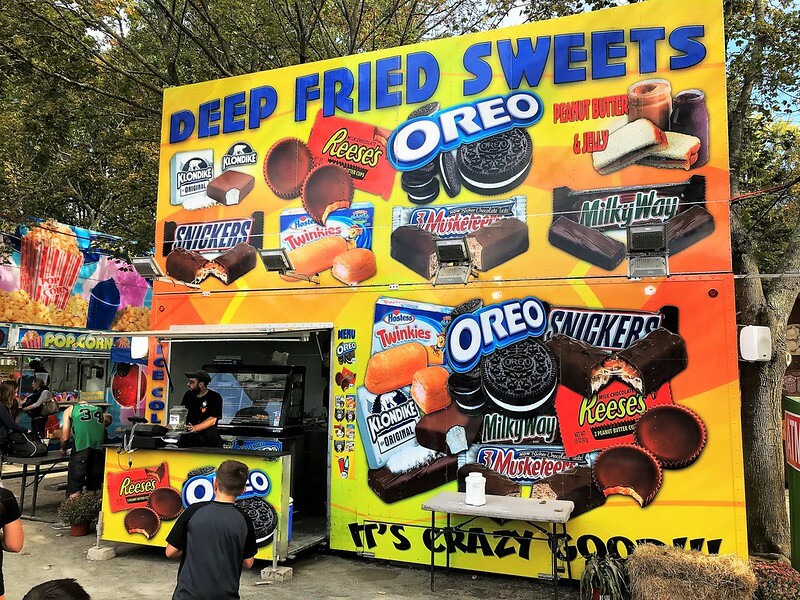 On Salem Common, there are plenty of food vendors and kiddie rides. 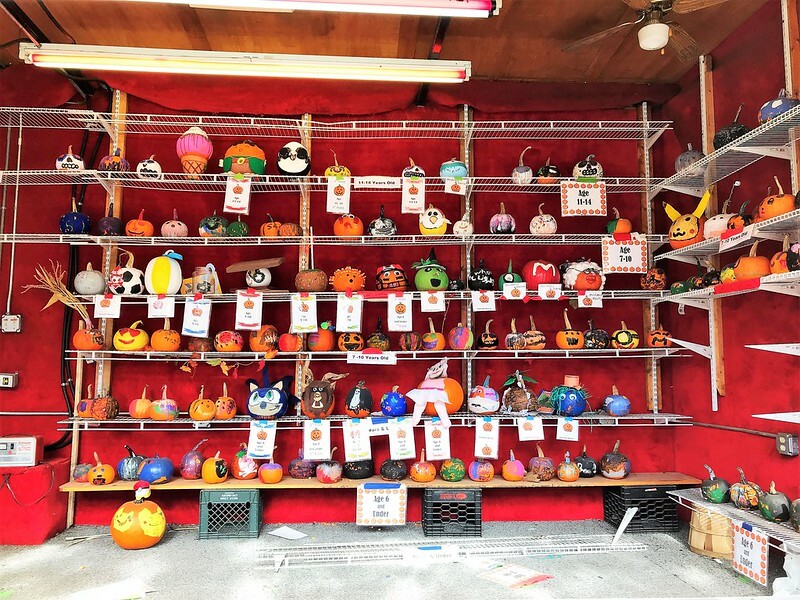 Also on the common is a trailer showing off the annual pumpkin decorating contest. And even though it's only October 7th, quite a few people are dressed in costume! The snowman was a lot of fun to watch. He mostly just stood still, waiting for the right time to scare someone that got too close to him. 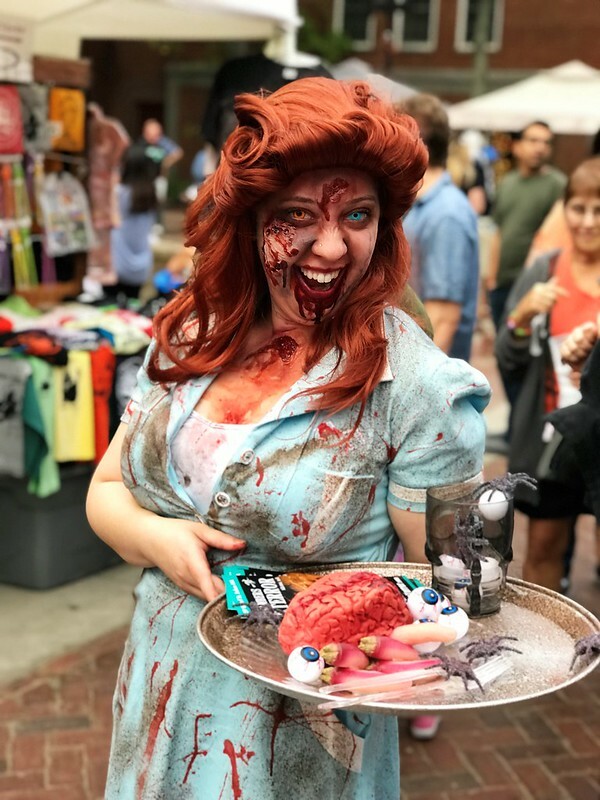 The zombie waitress actually works for a local business and was handing out pamphlets. Speaking of handing out pamphlets.. This is "Jesus guy." He's sort of a local "celebrity" as we've seen him at different events over the past few decades. If nothing else, I have to admire his commitment. 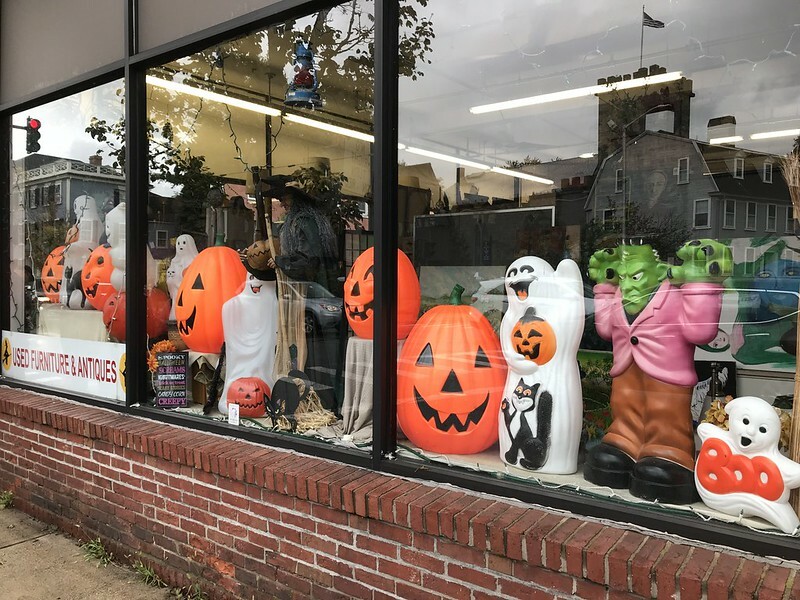 It being Salem, the store fronts also get "dressed up" for October. This one is from Witch City Consignment, which is right across the street from the Witch House, the only standing structure in Salem with direct ties to the Witch Trials. Sadly, or maybe luckily for my wallet, the blow molds are not for sale. This next one is a barber shop and I love it so much! I picked up a few things which I normally don't do. The first "thing" is a group of postcards by Maryann Piro. Some of them are whimsical, some creepy. I think they have a real story book feel to them. You can get a better look at them, and more, at Maryann's Etsy site. 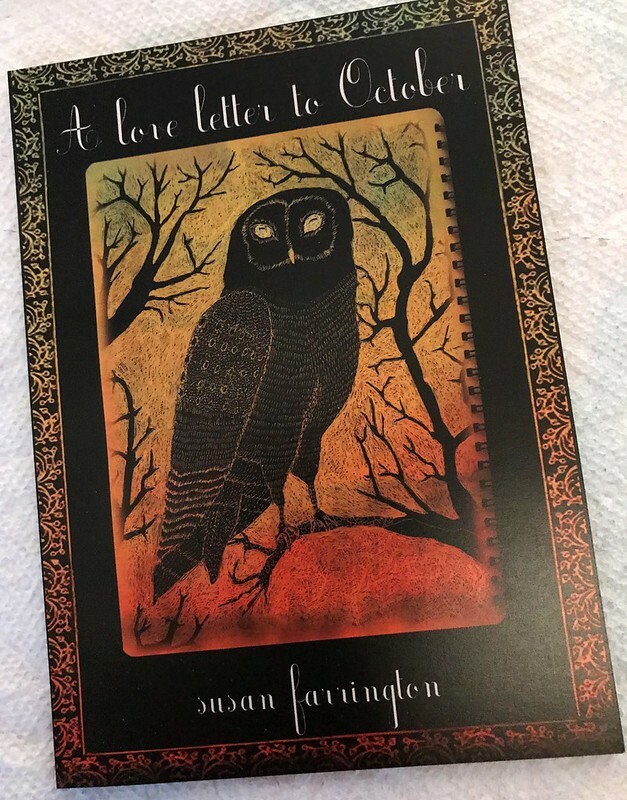 The other thing is a little book called A Love Letter to October by Susan Farrington. She has a really unique style using mixed media. 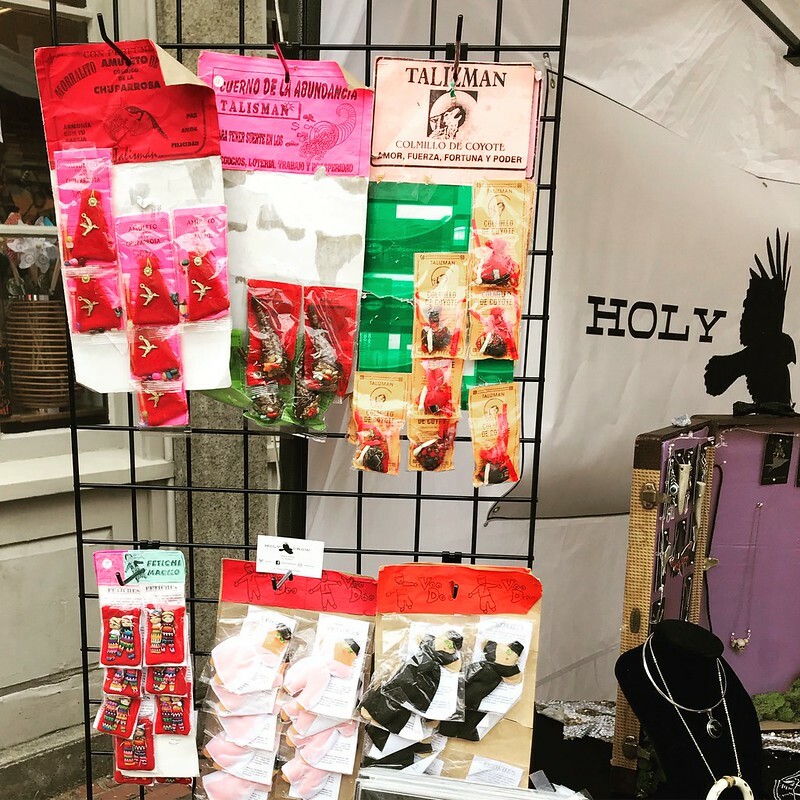 There's a lot more pics from Salem and the Bizarre Bazaar over on Flickr. If I'd put more planning into my posts, I would have split this up to show everything off. Oh well, it's almost Halloween! Be sure to visit all the participating bloggers by clicking the link below! No Halloween season would be complete without mentioning one the most famous ghost stories of all time. There's no shortage of things to talk about regarding the horrific Hessian but I wanted to focus on the song from Disney's version. I really enjoy this song and was surprised there have been so many versions over the years. 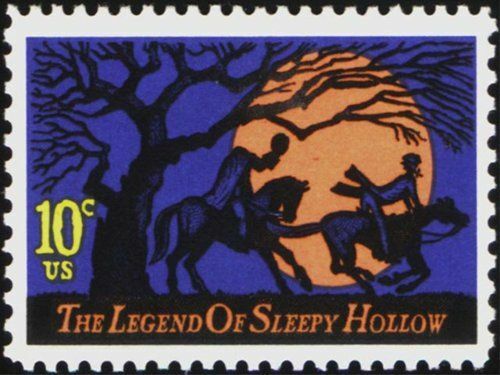 Below is the song that you hear in The Adventures of Ichabod sung by Bing Crosby. And then there is a version by Thurl Ravenscroft. If you're not a Disney fan, you might know him better as the original Tony the Tiger or the villainous voice behind You're a Mean One, Mr Grinch. I think you'll agree his booming voice is a bit more sinister than Mr. Crosby. Here's another cover by Kay Starr paried with a classic Betty Boop cartoon. Here's a fun video by Jonathan Kruk. The final version I'll leave you with is by New England's own Dr. Gasp (aka Dan Blakeslee). I've seen him a few times live and it's always quite a show. I highly recommend his Halloween Special album. If you want a few more versions, I put together a quick YouTube playlist. There's also a version I found on Amazon released last month by Annie Marie Lewis & Danny B Harvey that has more of a country twang to it. 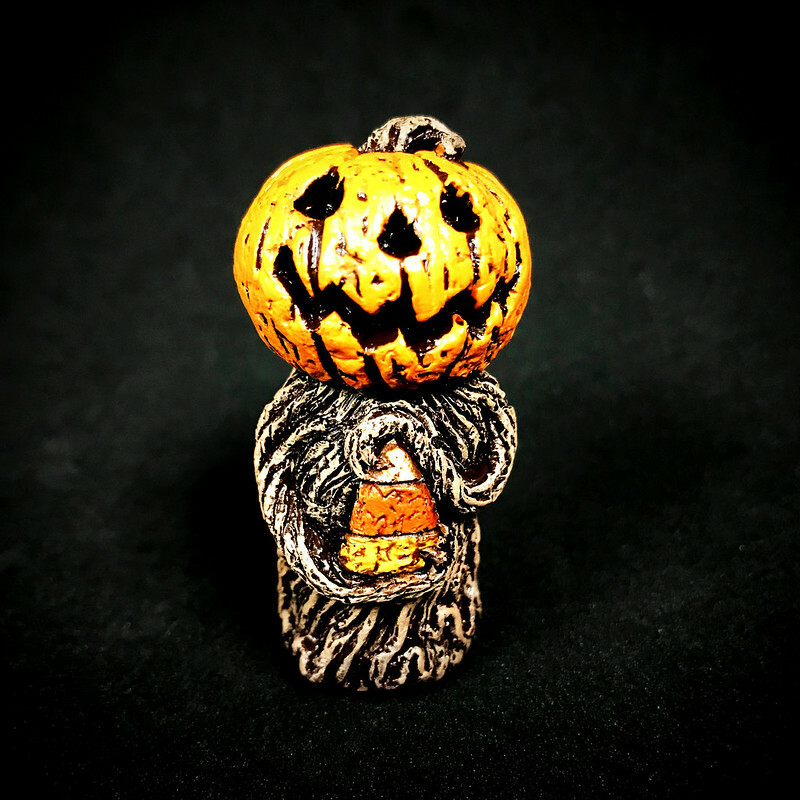 See all the Halloween goodness by clicking the link below! Halloween Web - Scott H.
We had a last minute final addition to the 2017 Halloween Web interview series! He's the husband of Kristen from the Life After Midnight podcast. Please introduce yourself to the folks. My name is Scott Harris, I'm a tour guide for Bewitched After Dark Walking Tours. I also work as a museum teacher at the Tsongas Industrial History Center in Lowell MA. I focus on labor history in culture, as well as public history. At the moment, I am knee deep with October in Salem as a tour guide! 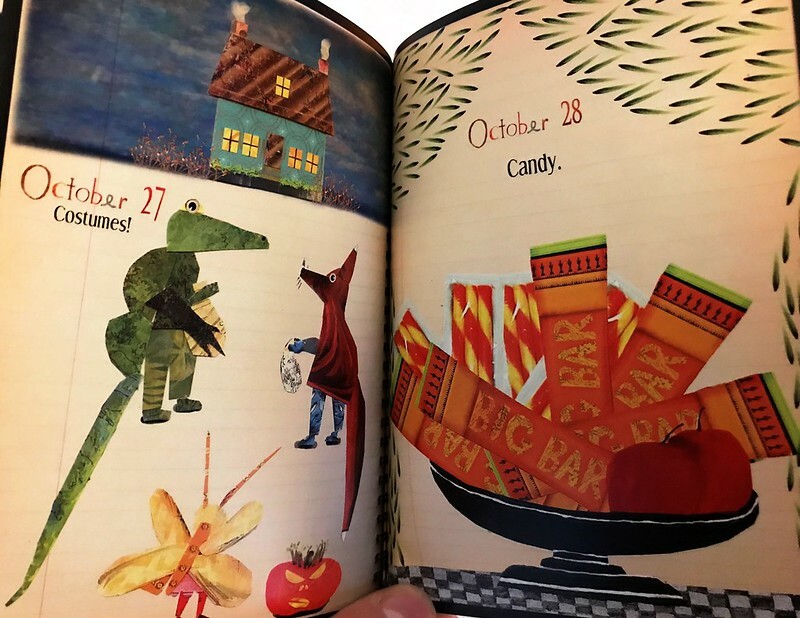 What was Halloween like as a kid for you? I remember Halloween being a big event for us and the neighborhood. All the kids would meet up with their costumes, and everyone would kind of trick-or-treat at the same time. 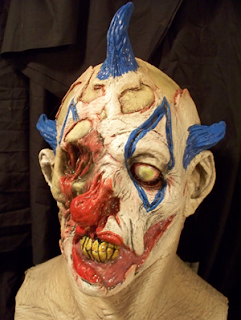 People would really get into it, with the big costumes, big candy, and yes even haunted houses. In fact, it sort of became a tradition to make haunted houses as elaborate as possible. 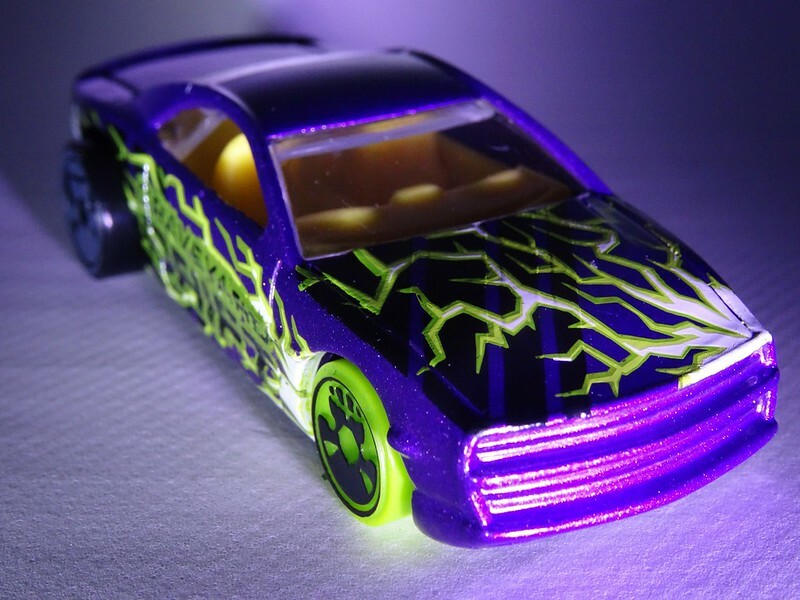 Any special memories of past Halloweens? When I was very young, a huge part of my family went all out making a haunted house. We had the garage set up, and even had people coming through the front door, and hid under a table that had a huge bowl with dry ice (in retrospect a terrible idea). But a kid from the neighborhood came up the driveway, and we had so much set up that he was intimidated, and my uncle scared him so bad that he just screamed and started running away. I mean this was like Forest Gump, he just kept running down the street. For the longest time, we would joke that the kid was probably still running. How do you celebrate today? 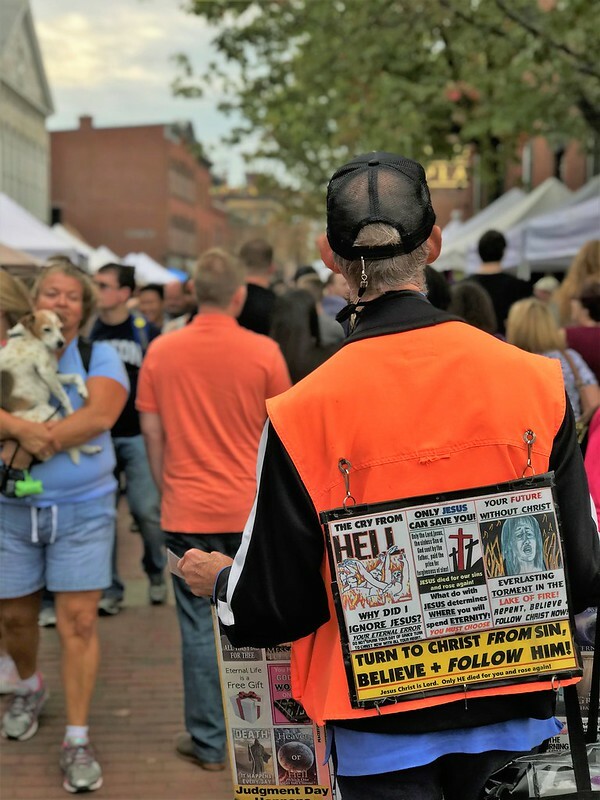 I celebrate every year in Salem, where I get to be a guide and go people watching! Sometimes my wife and I dress up for different events here as well. Any annual rituals to get in the holiday spirit? Every year we try to watch as many old horror movies as possible. It just isn't Halloween without watching Halloween, or Creature from the Black Lagoon (my personal favorite). Every year I have to listen to Misfits "Halloween" or Iron Maiden "Fear of the Dark". Candy is an absolute must! Also, nice fall beers and apple cider. 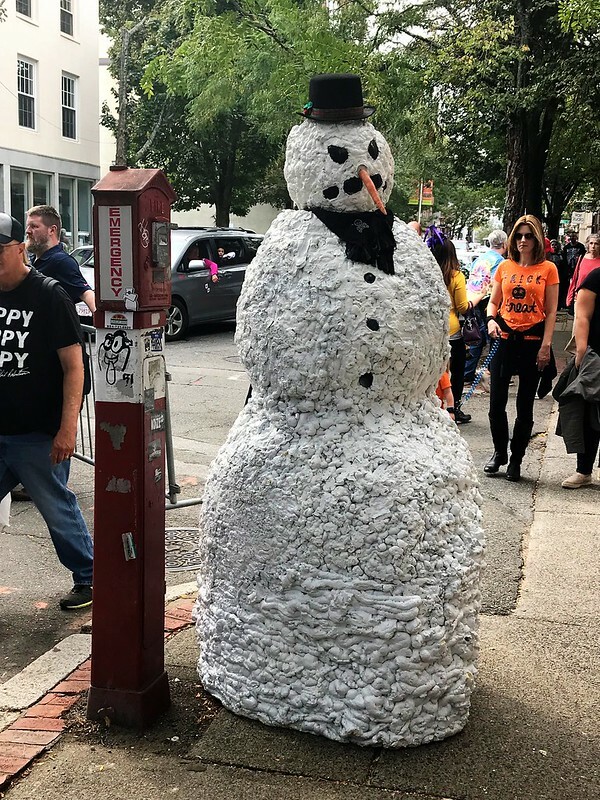 Why do you think we still love Halloween as adults? There's a sense of nostalgia, that child like innocence and being able to dress up like some of your favorite characters from either horror or other genres. There's also a bit of the macabre with it too, the celebration of the things that go bump in the night as well as death. You know, the scary things! The worst thing to get while trick or treating was Good and Plenty. That's not candy, it's cough medicine with colors. My favorite thing to get was my bag filled with candy. Nerds, Hershey bars, laughy taffy, Reese's cups. 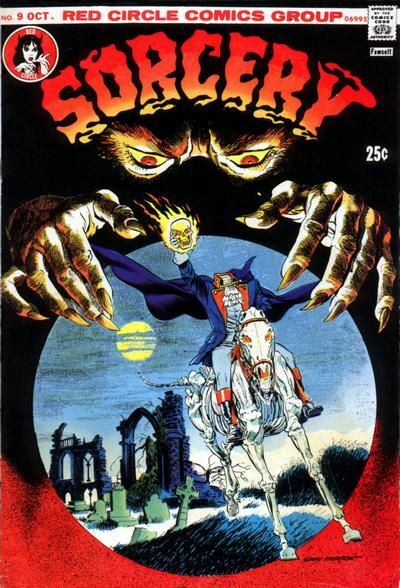 My favorite monster cereal is Count Chocula, forever. I don't have a site besides my Facebook, but do follow my wife's podcast Life After Midnight: Strange History Salem Style. That will wrap up out interviews for this year. 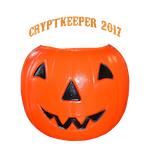 Be sure to visit all the Halloween houses by clicking the link below! Religious Pamphlets are your worst thing to get when Trick or Treating! The Orange and Black Peanut Butter Kisses didn't even put up a fight. Of course, in my head, I was expecting more than a handful of people to vote every week. Maybe some lost interest along the way? Running a new type of contest is always a learning experience. The winner of the Halloween goodie box is Beverly, final scores are below. I recently discovered The Horrors of Halloween blog which is devoted to horror flicks set during Halloween or the Fall season. A few years back I somehow stumbled into Skeleton Farm's Halloween Horrorshow and absolutely loved it. When I went to look it up this year, that's when I found Horrors of Halloween and their amazing list of Halloween and Christmas horror video mixes. What? There are MORE of these beautiful things? This video features clips from horror movies and is totally NSFW! 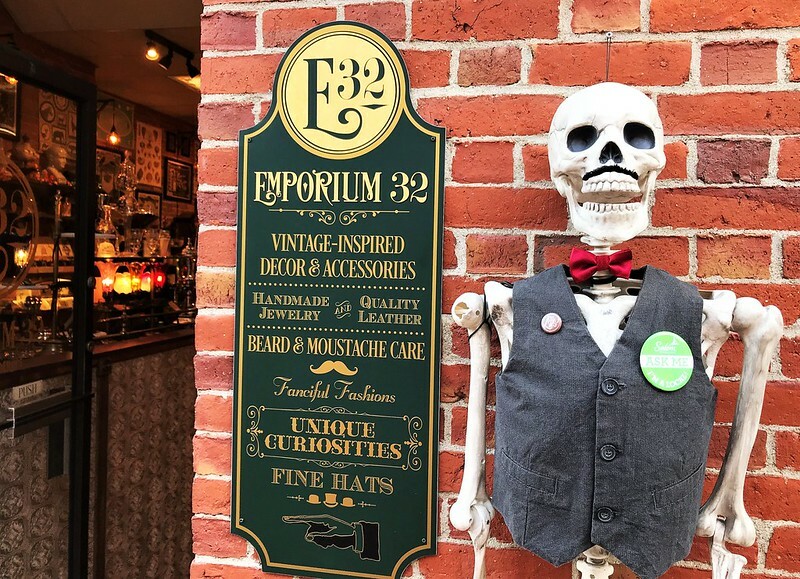 If you venture over to the blog, be prepared to lose a lot of time as there is just an incredible amount of stuff there to keep you busy until Halloween. If you head over there today, you can see the short Helltown which mashes up cinema's horror icons into one crazy video. 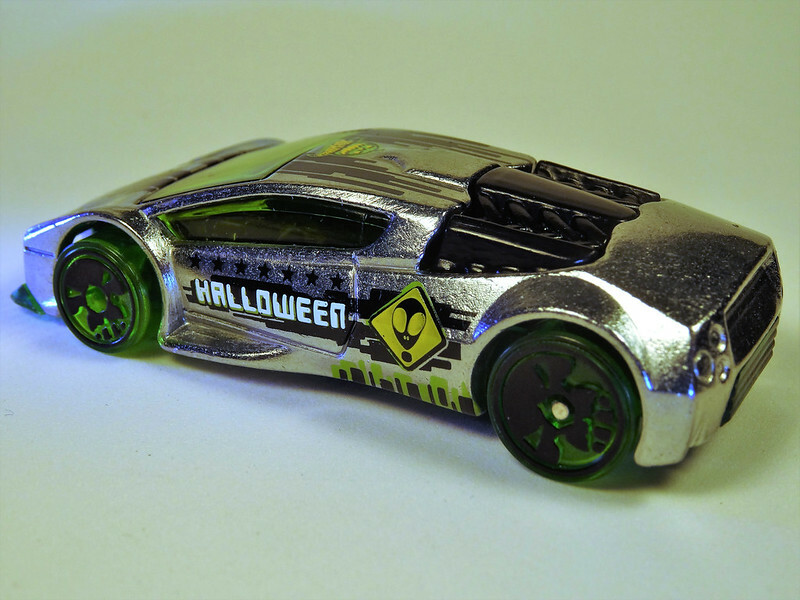 The 2017 Halloween Hot Wheels line crosses the finish line today with the final two vehicles. Leading things off is Muscle Tone. 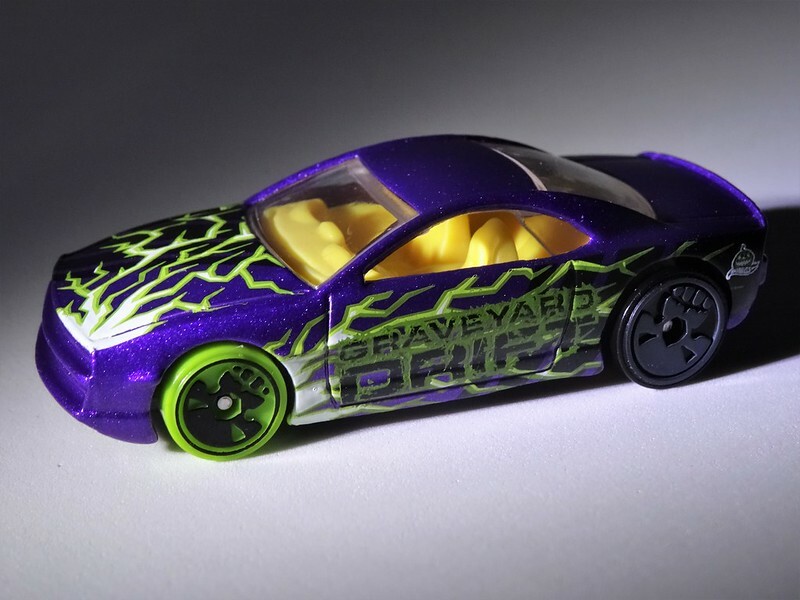 I don't know if it's the paint job or the word drift on the car but I could totally see this one in a Fast & Furious movie. That, of course, leads me back to thinking about a monster/horror version of the film. In case you're looking for Smiley (the Halloween logo), he's barely visible at the back. I really like the way the lighting (and lightning) came out on this shot. Muscle Tone may be the "oldest" model in this run, first released in 2000. It has been featured in the Age of Ultron series as Vision and in the Batman v Superman series as Superman. Bringing up the rear of the pack is Zotic. I don't know what is it but I'm just not a big fan of lumping aliens in with Halloween. Sure they can be creepy and scary but I just don't associate them with the holiday. I'd like this one a lot more if it didn't have Halloween written on it because it does the alien vibe so well. If it said Area 51 or Roswell, or anything more alien-y, it'd be great! Maybe I'm being specie-ist in presuming the big eyed head is an alien? Could be an insect or even a gas mask if you squint. The overall sci-fi look is what makes me think it's an alien. The photos don't do the shininess of the silver justice. 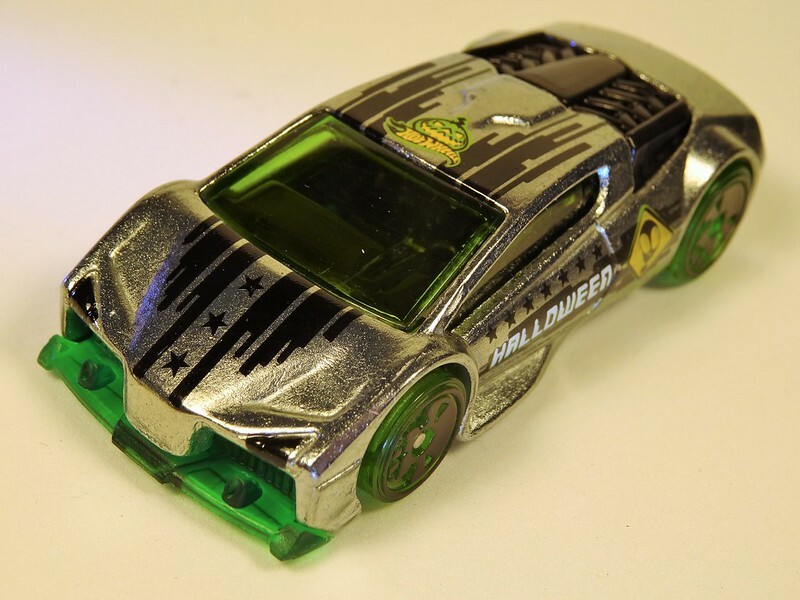 The translucent green they used for the wheels and windshiueld is a perfect alien color. With that being the last in the series, here's my rankings for 2017, best to worst. 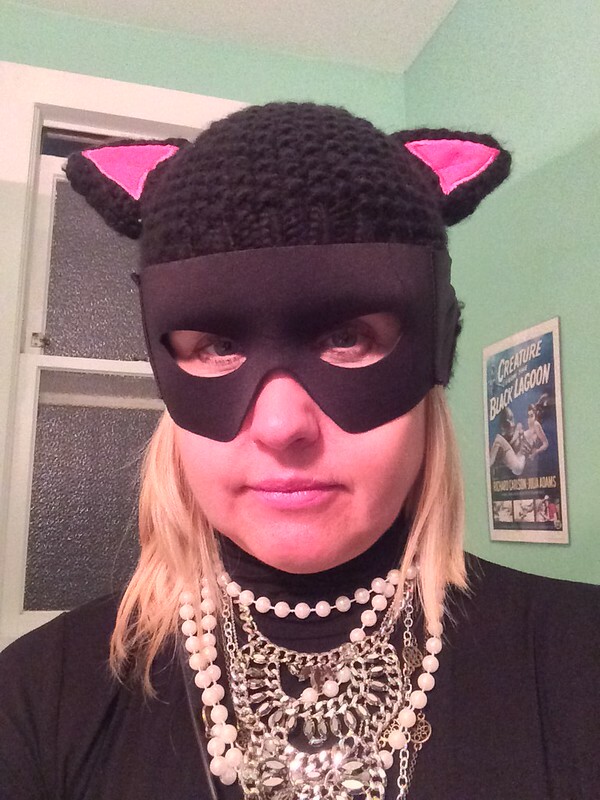 Out possibly last Halloween Web interview features Karen from the blog Halloween Special. Come on in and introduce yourself to the readers. I’m just a regular Halloween freak. My friends think of me as a Halloween queen, but to everyone else, I’m just a quiet, pleasant blond girl. I like being incognito. What was Halloween like for you growing up? 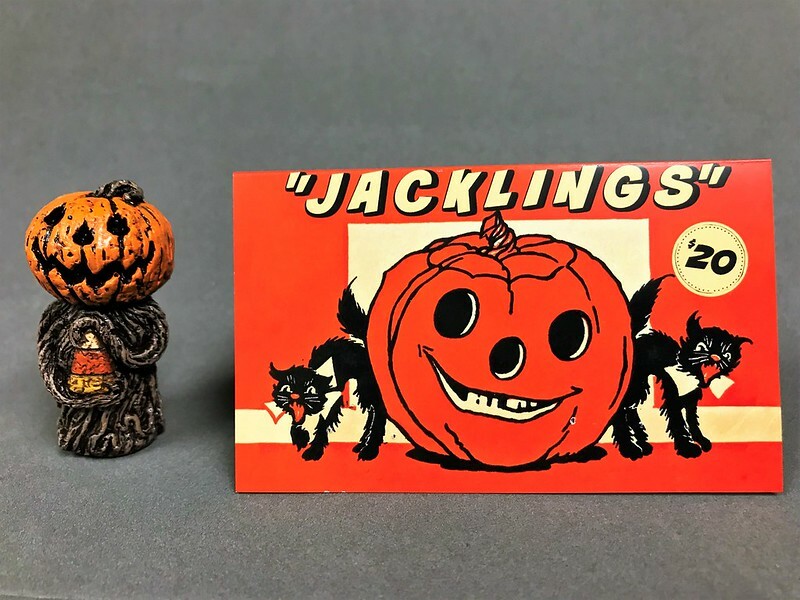 The first Halloweens I remember were in Danville, CA, in the east bay. It’s a pretty ritzy burb now but back then it was just a one horse town with an old west-style main drag. We’d work on our costumes all month and then at the last minute my mom would make us wear sweaters over them. Not kidding. But it was still magical. I think the idea of being out at night with my friends but without my parents had a lasting euphoric effect. Plus, you got to dress as something scary and get candy! I’m still not over it. Once we moved to Sunnyvale in the south bay, I was old enough to spend the night at my friend Brienne’s house and trick or treat as late as we wanted. It was this feeling of intoxicating freedom. You’d run into other kids but you weren’t sure if you knew them because of the costumes. This was mysteriously thrilling. This local family called the Flaglers went all out with their decorations. That year they had a very realistic coffin laid out in the front and they were performing some kind of ritualistic service. I think it really freaked some kids out, but I LOVED it! Then we went home to Brienne’s house and I got to watch Halloween for the first time! I don’t think I slept much that night but it was worth it. 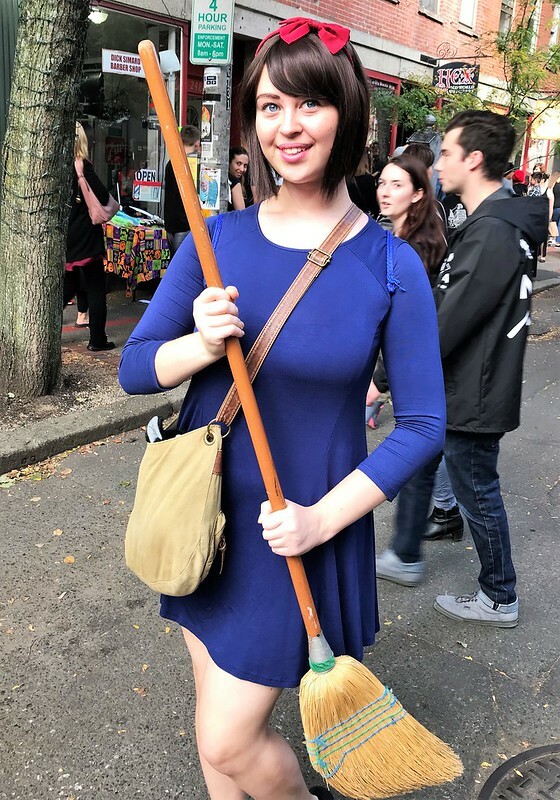 Any memorable costumes from past Halloweens? I was a gangster when I was 11. It was ridiculous. I wore a newsboy cap with my blond hair spilling out and my nerdy glasses on. I wore a suit and tie and a pencil thin moustache. The crowning achievement was that I stuffed my cheeks with cotton balls because I’d heard that Marlon Brando had done that in the Godfather. Such a bad idea - it kept getting caught in my braces. Am I painting a completely dorky picture? Some years I dress up, some years not so much. But every year my boyfriend and I swing by Belvedere St. in San Francisco. They block it off to traffic and every house is over the top! Kid are literally losing their s***. (Well, not literally, but you know what I mean.) It’s hysterical. Then we’ll barhop around the city and soak up the atmosphere. It’s a bit like trick or treating, but with booze. This year, I’m dressing up as Valak from the Conjuring 2. It’s the perfect combo of scary + comfy + warm + not overplayed. Every year I go to LA at the beginning of October to see some friends and do Knott’s Scary Farm and whatever else we can find. This year, we watched Halloween on a big outdoor screen with a bunch of other like-minded souls and ate lobster rolls from a food truck. We also swung by the Cecil Hotel and the Blade Runner building downtown. One year we found a monster movie exhibit at the Max Factor museum in Hollywood. 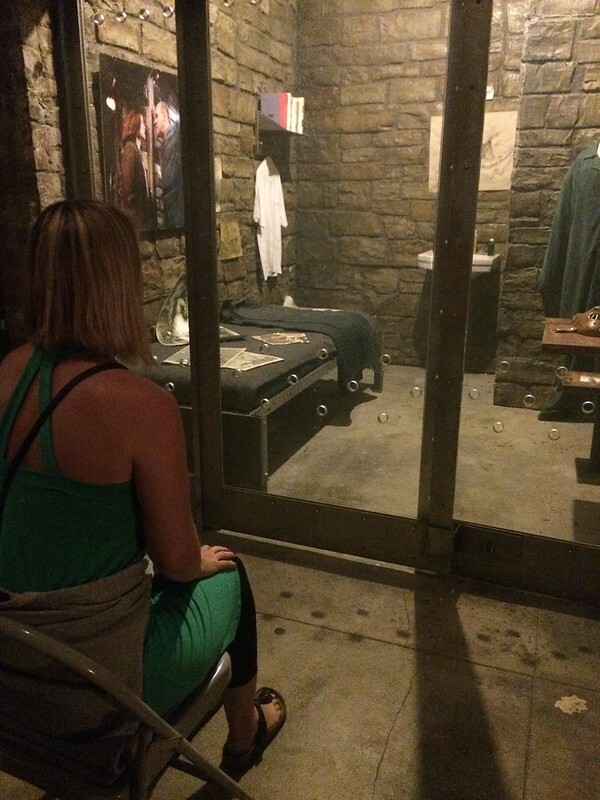 They had the real set of Hannibal Lecter’s prison cell. In this photo, you can see me pretending to be Clarice. Do you watch anything special to get in the spirit of the season? My Halloween movie/TV list is constantly growing but in general, I’d say my faves are: Halloween (of course), The Shining, Trick r Treat, Young Frankenstein, The Wolfman, Bride of Frankenstein, Conjurings 1 and 2, and pretty much any Treehouse of Horrors. Why do you think we keep Halloween with us as we get older? I think it’s just that excitement we remember from being a kid. 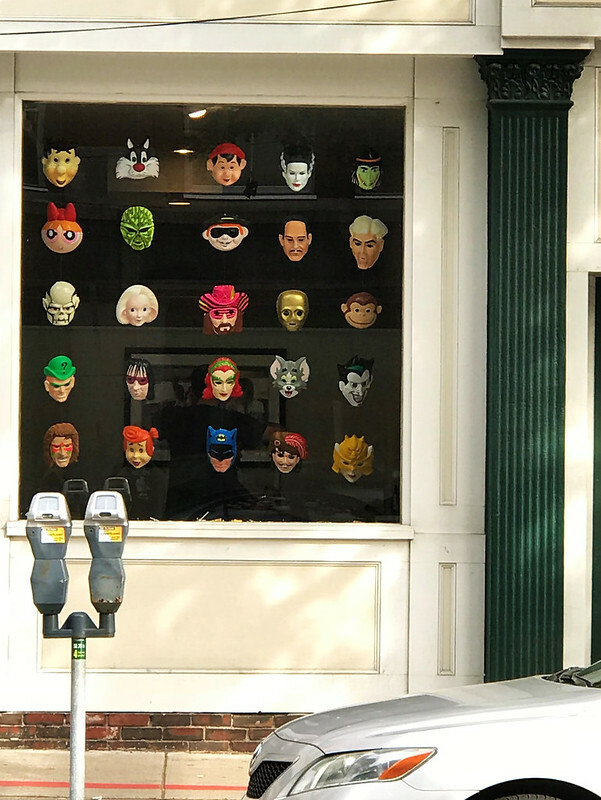 When I saw those first decorations go up or masks in a store window, I’d gasp like a spaz. I still kind of do. And I think Halloween is the first step in making friends with the stuff that scares you, which is a good life-long lesson. The worst thing to get while trick or treating was those orange and black wrapped candies with no labels on them. I actually never tried them until recently, only to find they’re not bad. My favorite thing to get was sweet tarts and pixie sticks. Have no idea why. My Halloween blog is Halloween Special, because I loved nothing more than Halloween specials when I was kid. Oh, and now too. The best are Roseanne and the Simpsons, of course! I was lucky enough to snag one of these limited edition figures and he showed up just in time for Halloween! This Jackling is made by Cryptocurium who also does the Order of the Thinned Veil. If you don't know what that is, please put this on hold, click that link, then come back. You can thank me later. 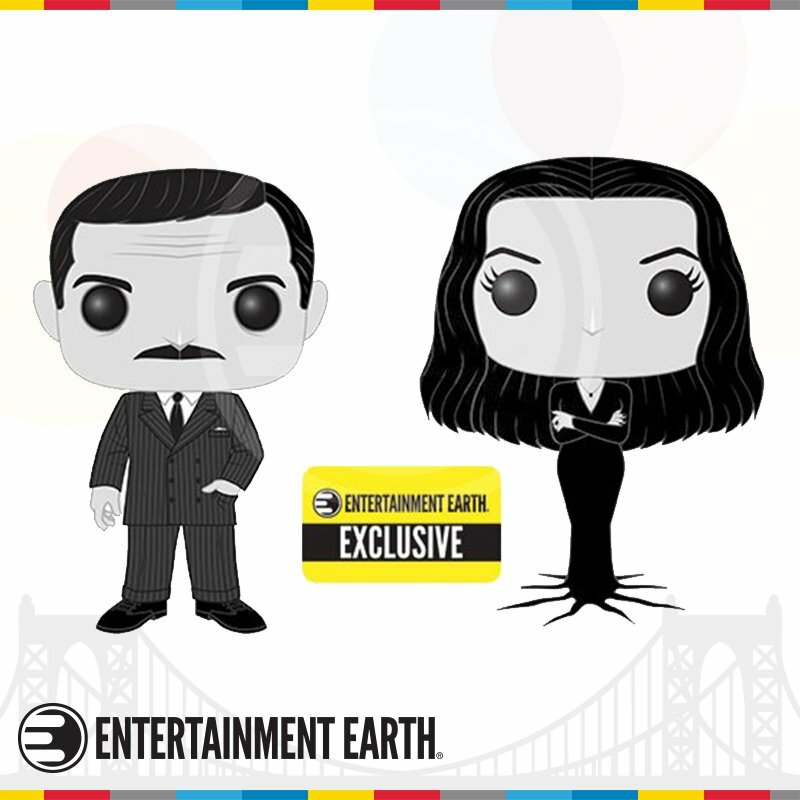 The figure is about 2.5" tall, about the size of the old school Fisher-Price Little People. He comes packaged in a clear plastic bag stapled to the card above. It was a real dilemma whether or not to free him from his plastic prison but after some careful staple prying, he was let loose and I was able to keep the card intact. Here's the back with the lore on Jacklings. This little guy is going right in front of my monitor to keep the Halloween spirit alive year round. Check out Cryptocurium on Etsy where you can find more of his stuff including horror magnets and some really rad Cthulhu artifacts. Today's interview subject is Leigh, The Sharpie Domino Queen. Hi Leigh, tell us all about you. Hello and Happy Halloween to you all! My name is Leigh Snaith-Brunton and I’m a Fine Artist and Designer of pretty much everything, if it’s art related I do it. I’m mostly known for my involvement in the world of Rubber Stamping which has been my passion for well over 20 years now and in the doll collecting communities for about 6 years. I earned my nickname, The Sharpie Domino Queen, in 2001 when I pioneered Sharpie marker coloured art on dominoes and have had my altered game art, paper art and articles published in leading rubber stamping magazines. It’s been a long over due dream of mine to have my own art stamp company and launched LeighSBDesigns Art Stamps earlier this year. I’m enjoying my new creative adventure and invite everyone to take this journey with me. My digi stamps are available in my LeighSBDesigns Etsy Boutique and I’ll be releasing the designs in rubber soon too. I’ve also launched my YouTube channel where I share time lapse Copic colouring tutorials and more. You can follow my creative adventures on my blogs and social media (links at end of interview). How was Halloween when you were a kid? I was born in the UK and grew up in South Africa and sadly neither countries did Halloween when I was a kid. I’m pleased to say that both now thoroughly embrace the Halloween spirit! My sister and I loved watching how kids in the USA celebrated on TV so we decided to do our own Halloween as it just didn’t exist where I lived as a kid. We literally would walk to the end of the driveway and back and Trick or Treat at our own house, LOL. I think a neighbour’s house got roped into it at one time or other as well but it was always just my sister and we loved it. Do you have any yearly rituals to celebrate the season? I have two yearly rituals. 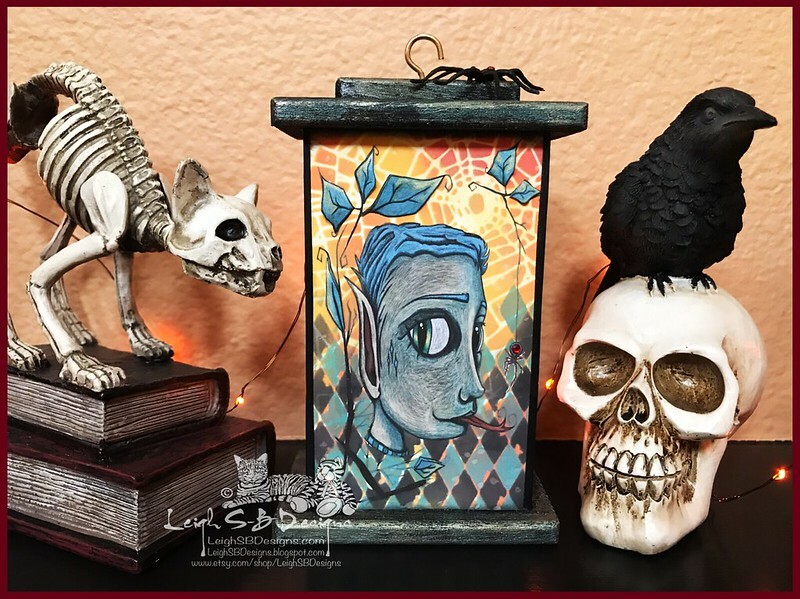 All my Gothic dolls come out and I thoroughly enjoying creating Halloween displays with them in my home. 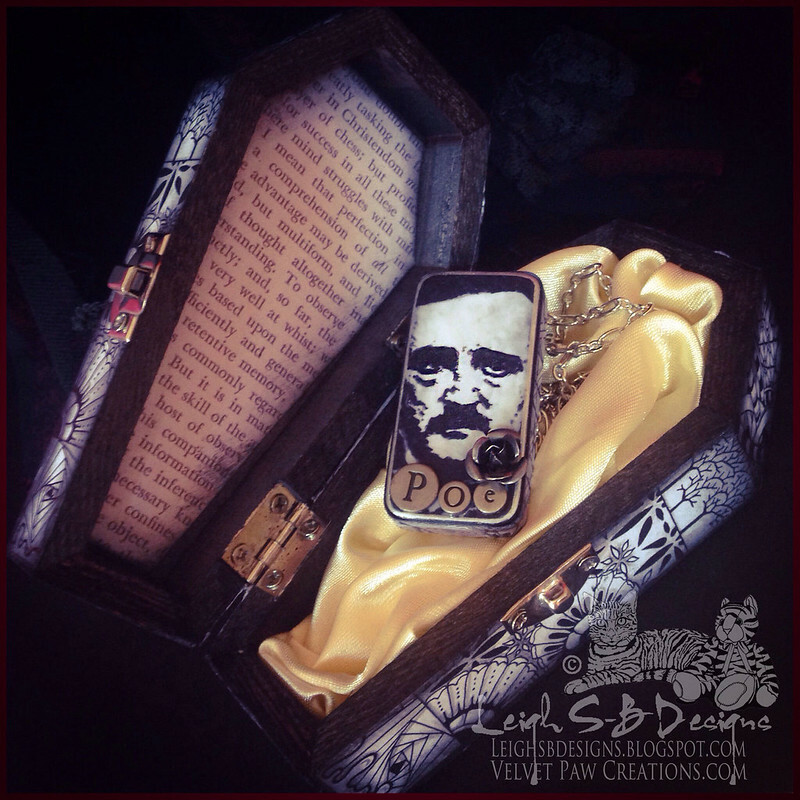 This year my vampire Iplehouse dolls and various others are presiding over the festivities but I haven’t taken photos of this year’s displays yet but here’s a look at some of my past years. 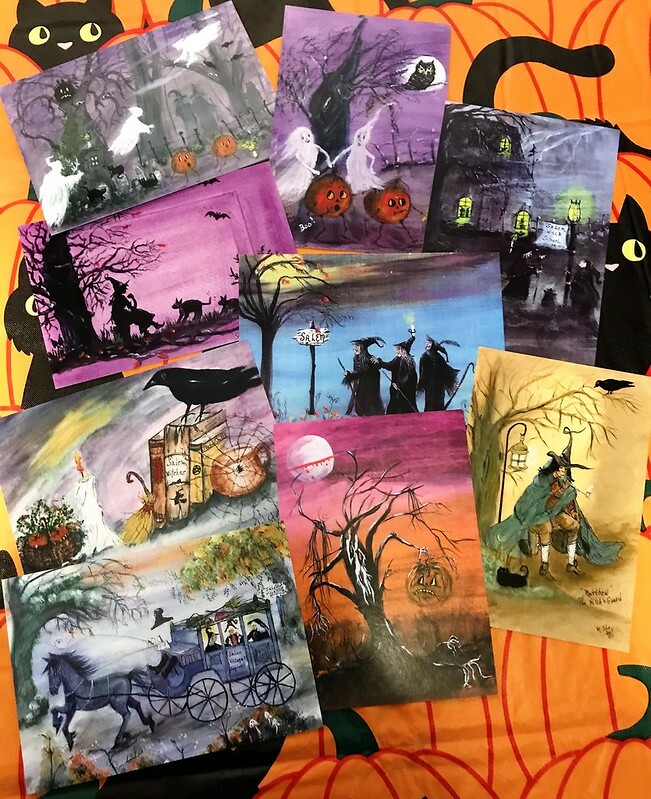 Secondly, my love for altered game art lead me to start an annual 31 Days of Halloween event on my DominoART blog which evolved into my blog participating in a big annual 31 Days of Halloween blog hop. It’s faBOOlous and exhausting as we share stamp art for 31 days straight while hopping and commenting on all the blogs participating. This is my 6th year in the hop and sadly it’s not as massive as it used to be when 30+ blogs participated. 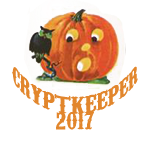 I thoroughly enjoy it and I’m proud to say I’m now doing it with my own line of art stamps this year and also to be a Cryptkeeper each year too. Do you have any favorite costumes? 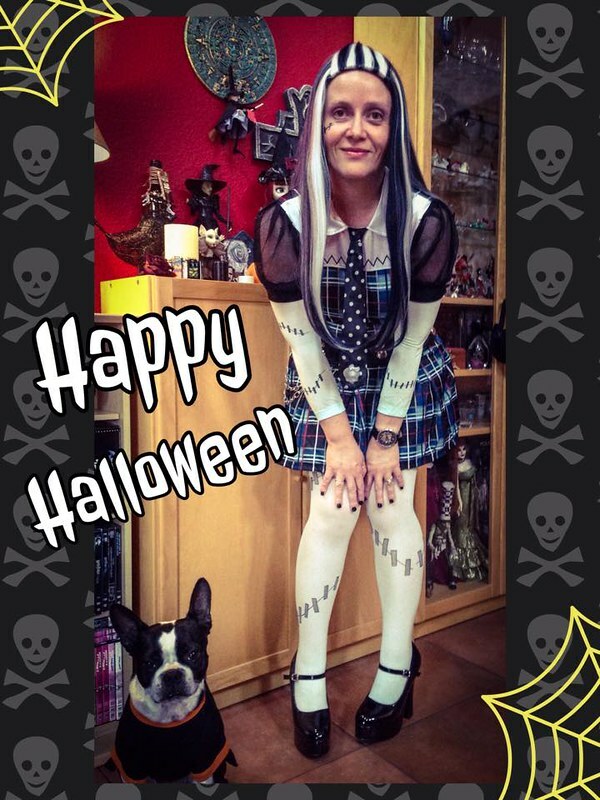 As an adult collector and fan of the original Monster High doll line by Mattel my favourite is cosplaying as Frankie Stein the daughter of Frankenstein. 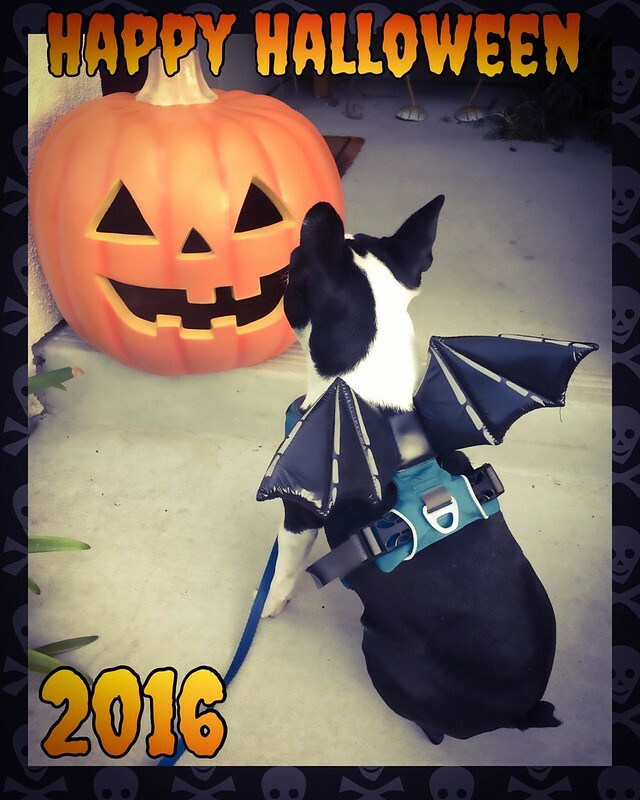 My Boston Terrier also dresses up and that year she wore a jersey that said "I’m Really a Cat in Disguise" LOL. She’s partial to her bat wings though. Do you watch or listen to anything special for October? Michael Jackson’s Thriller is a must and I re-watch Hocus Pocus and The Nightmare Before Christmas every year along with every scary movie being show on TV. 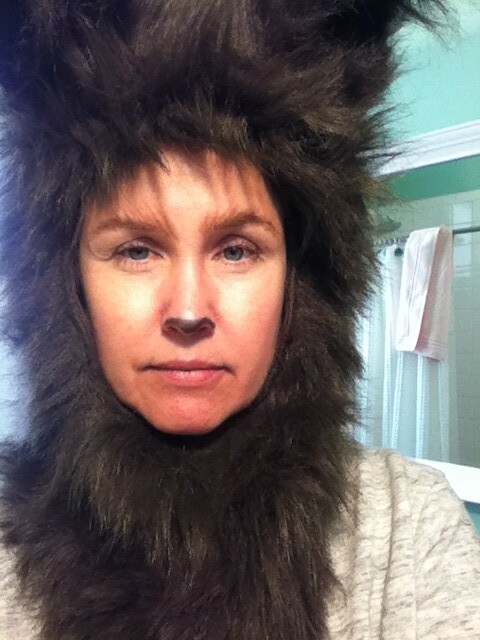 Why do you think we still enjoy Halloween into adulthood? I’m a kid at heart and Halloween keeps the magic alive. I feel exactly the same way about Christmas and given the chance I’d go to Disneyland every October and December. The joy, the magic and the wonder of it all just makes my heart sing. The worst thing to get while trick or treating was I wish I’d had the opportunity to get something nasty, my Mom made sure we only got yummy sweets aka candy. My favorite thing to get was everything was my fave coz we made our own Halloween. There's my site, LeighSBDesigns as well as Facebook, Instagram, Twitter, and Pinterest.